Mouse smoothing is much like angle snapping in the sense that it alters the raw input of a user in favor of ‘predicting’ what said user wanted to do with the mouse. Modern (gaming) mice are very accurate when it comes to reporting where their users are moving the mouse, but older sensors (or even trackballs) were not nearly as accurate as the mice with optical sensors that we have nowadays. Older mice didn’t have a very high DPI count which made the movement of the cursor seem pretty abrupt at times. Old mice simply weren’t accurate enough (‘current’ trackball mice have a max DPI of 400, for example) to measure enough points per inch in order to come up with a smoothly flowing output, so in order to smooth out mouse movement manufacturers came up with mouse smoothing. Simply put the PC tries to predict where the mouse will be going and adds extra, virtual measure points where it thinks the mouse is going in order to create a smoother, more visually appealing movement pattern. 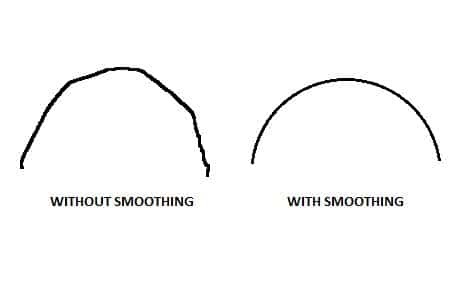 Mouse smoothing is still used today, since most office/’regular’ users of mice don’t really care for pixel perfect precision, nor do they actually need it. The example to the right is a (slightly exaggerated) example of how mouse smoothing can affect the cursor. In short: for gaming you want your mouse to register your movements as raw as possible. Any (software or hardware) attempt to alter what is being shown on screen can negatively affect your performance and it’s the same with smoothing. Contrary to angle snapping though, some people seem to think that mouse smoothing can be something good. Aside from the fact that it makes your aim feel ‘floaty’ (since your cursor isn’t doing exactly what you are doing with your mouse) it can also put a damper on your performance in other ways. If you’re going for a quick, pixel-perfect shot on an enemy that’s barely exposed and you drag your mouse towards that enemy in a somewhat erratic pattern (which will be the case most of the time, since human beings generally can’t move their hands in a perfectly straight or concave line) a mouse with smoothing might ‘correct’ your movement and cause your cursor to skip past those few pixels of visible enemy and thus miss the shot where you would have otherwise hit that same enemy. That’s a pretty extreme example, but it is something that can happen and it’s one of the reasons why it’s so important to have a mouse with a flawless (meaning it doesn’t alter anything about your movements being translated to the screen in any way) sensor. Unless you’re playing a casual singleplayer game we always recommend to turn smoothing off.